Geneva, 4 January 2008: - - The Office of the High Commissioner for Human Rights released today the preliminary findings of the United Nations Human Rights Office in the Democratic Republic of Congo (UNHRO) investigation into the Kinshasa events of March 2007 and their aftermath concluded that serious human rights violations were committed during and in the aftermath of the violence between DRC Government Forces (FARDC) and members of the personal security detail of former Vice President Jean-Pierre Bemba (DPP) on 22 and 23 March 2007. In a report released today, the multi-disciplinary investigative team headed by the UNHRO concluded that around 300 persons lost their lives during the hostilities and in their aftermath. Incidents of serious human rights violations were also documented. These include excessive and indiscriminate use of force throughout the military operations conducted by the Armed Forces of the DRC and the Republican Guard (RG) and use of heavy weapons by both sides in the city centre as well as in heavily populated residential areas where no military objective could justify the means or degree of force used, and where no consideration was given to the safety of the civilian population. 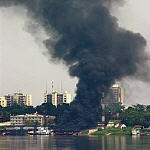 Numerous acts of looting and destruction of property, particularly in downtown Kinshasa, were also recorded. These were found to have been committed first by the DPP and subsequently by the FARDC and RG soldiers. The investigative team received credible information that at least 40 civilians and surrendered DPP soldiers were summarily executed. Reports of mass burial sites and evidence of bodies of unidentified victims recovered in the Congo River, however, indicate that there may have been a significantly higher number of summary executions committed. Over 200 persons, mostly from the Equateur Province, were arrested, in many cases without the correct legal procedures being followed, and a significant number of victims suffered cruel, inhuman and degrading treatment while in detention. The investigative team also documented cases of intimidation and harassment by security forces in the wake of events. According to the report, the Chief Military Prosecutor established a Commission to look into the legality of detention of those arrested during and after the violence but only ordered the release of five detainees on medical grounds. Beyond this, the report noted that no other investigations or prosecutions were initiated against members of the RG, FARDC or Police suspected of committing serious human rights violations during the events. The investigative team recommended: that a judicial investigation be carried out by the Congolese authorities; that victims of the events who lost family members, who were injured, or whose property was damaged be compensated or indemnified; and that the Congolese authorities should issue a comprehensive public statement about the events, providing the population with an explanation of what happened and what has been done by the authorities since the events to correct wrongdoing by Government Forces, the DPP, the Police, or other security services.